As previously mentioned, I need to create a new kitchen in the carriage house on a $1.98 budget, as I am still paying off the titanic-sized invoice to repair/restore the radiator system in the Cross House. As such, I am doing most of the work myself, although pixies seem to show up when I am not looking. I am also having to make do with things I already own, or can pick up cheaply in salvage yards. 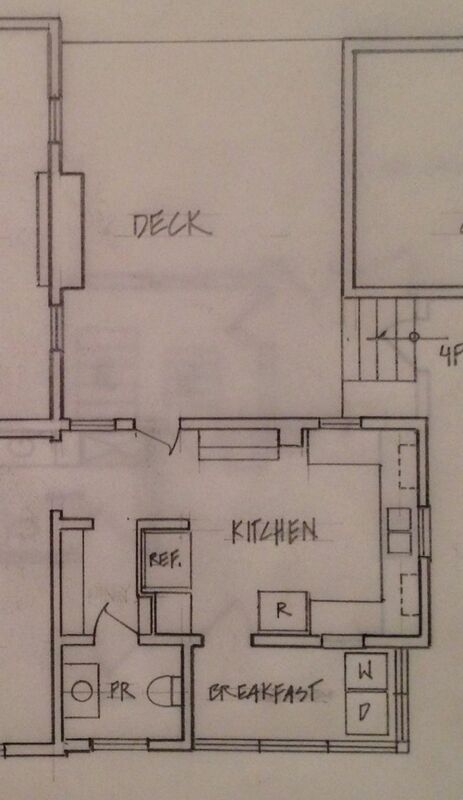 This is the new kitchen plan. See the WALL where the door to the deck and adjacent window are? See the DOOR to the deck? See the CABINET just to the right of the door leading to the deck? See the WINDOW in the powder room? See the two OVERHEAD cabinets on each side of the sink? See the SINK? The WALL. The door is in the 1921 location. 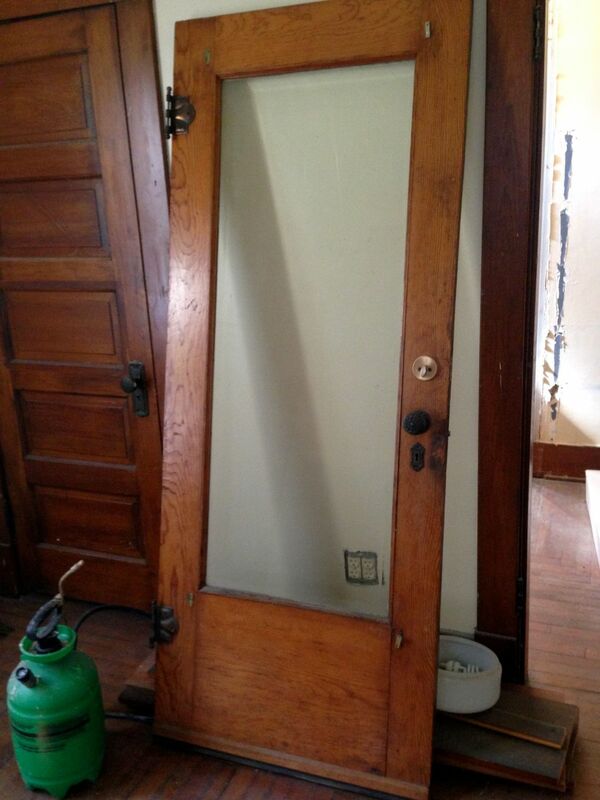 The door frame is either from the 1921 conversion or is original to the 1894 carriage house. 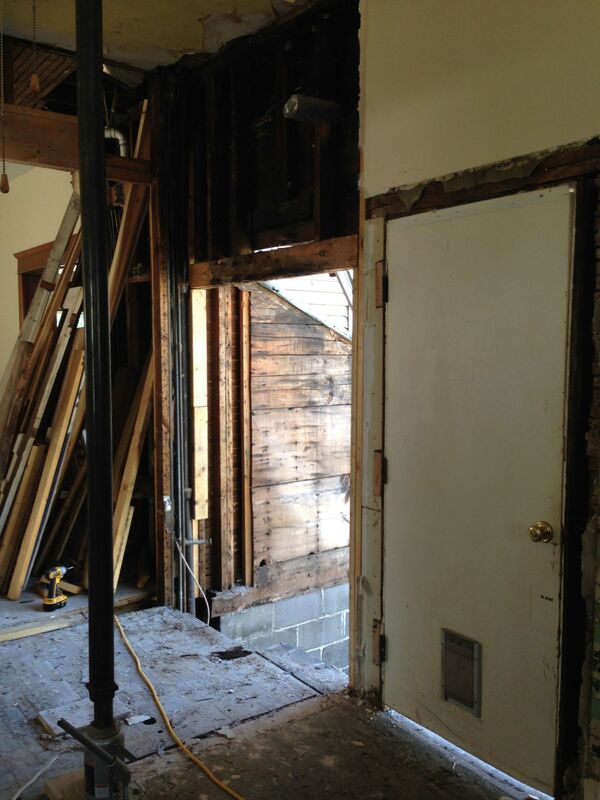 Adjacent is an original exterior wall that was a rotted, structural mess. I tore it out. The WALL. 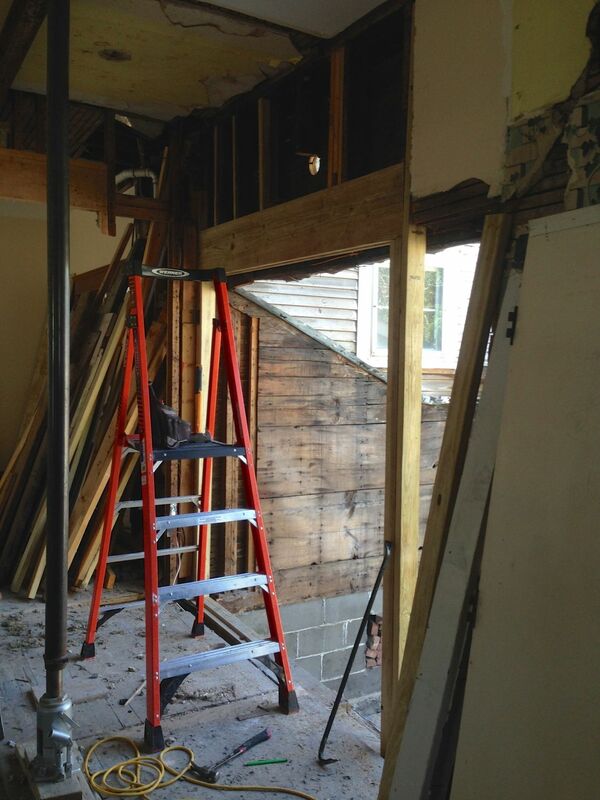 Door frame removed, and wall reframed to accept relocated door and adjacent window. The DOOR. The door frame had a horrible solid-core modern door. 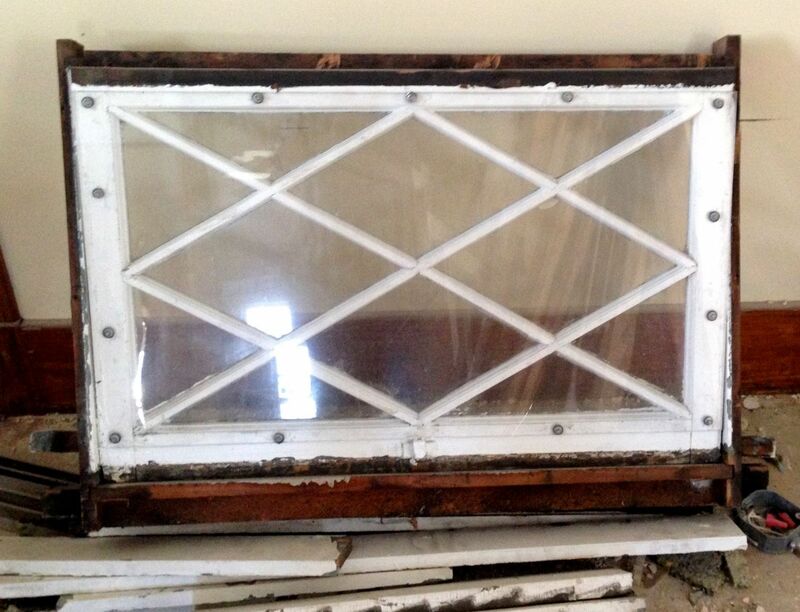 From a salvage yard, I purchase this gorgeous door with beveled glass to replace it. The CABINET. The 1921 kitchen was totally gutted circa-1950. This cabinet, in the soon-to-be powder room, is, I assume, from the 1921 kitchen, and was banished, I assume, into a closet during the circa-1950 renovation. It is lovely, and deserves to be seen to better advantage. So, I am going to move it to a place of honor next to the door to the deck. The WINDOW. I am particular about certain things. Like, every bathroom should have a window. 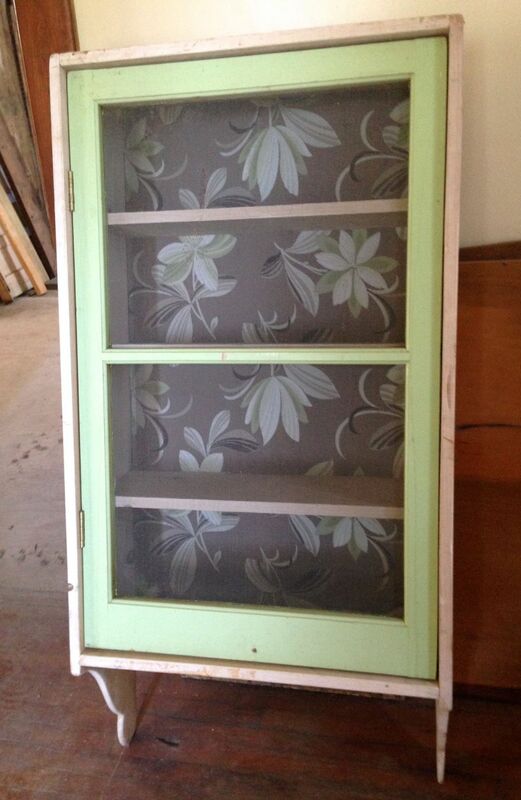 So, the new powder room will receive this lovely window. It is, I believe, original to the 1894 carriage house, and was installed somewhere on the main level. Later, it was located in one of the additions connecting the carriage house to the circa-1950 garage. I tore these additions down last year, but saved the window. For, I knew just the place for it. Oh, the second floor has all diamond-paned sashes. …and had a single roll of 1940s wallpaper which was the PERFECT complement to the green doors. I have a particular affection for 1940s wallpaper. The doors retain their screens (which cannot be seen in the images). 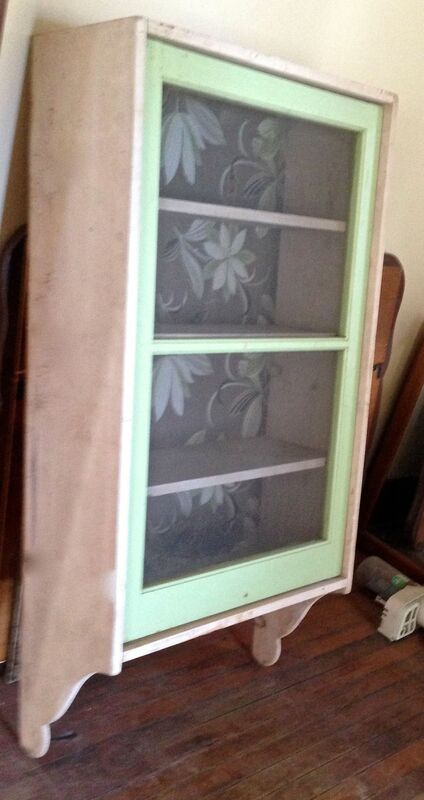 For some reason I never put the pair of cabinets up for sale, and have hung onto them for years and years. But now I have the perfect place for them, on the wall above the base cabinets, and to each side of the sink. It will be a THRILL to at long last see the pair hanging up and lookin’ good. Whoee! …which is a very period-specific detail I love. Such rings were created in 1948, and were popular to about 1970. 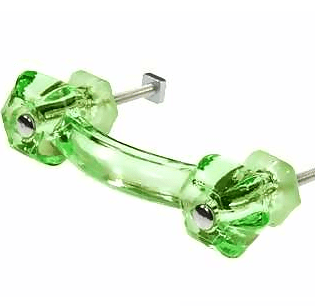 Due to the tight budget, I plan to reuse the Home Depot base cabinets (insert tears here), but will perk them up a bit with vintage green glass pulls. The green will nicely pick up on the upper cabinets. All this activity is due to my having a couple wanting to rent the carriage house. 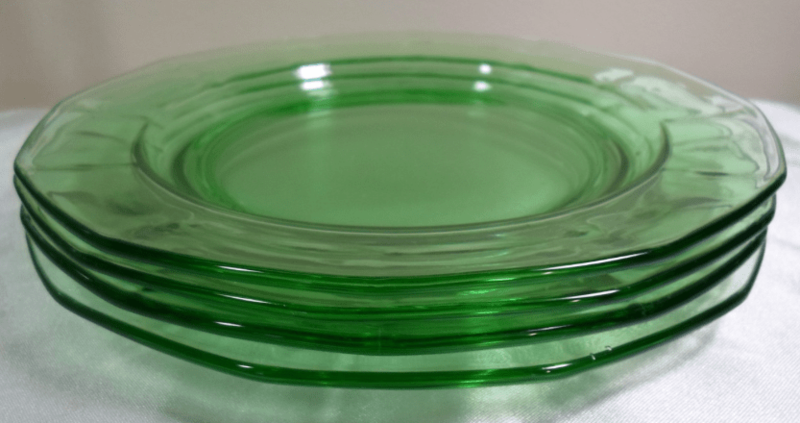 I am pretty sure that I should add a clause to the lease specifying that they can ONLY put green glass vintage dishes in the upper cabinets. Right? So, this motley collection of fixtures/doors/cabinets will make up the new kitchen. There will, of course, also be very cool vintage lighting, and the 1921 pine floor will be refinished and gorgeous. Gorgeous! I am uncertain as to the wall color, but will be retaining the strip of 1930s wallpaper above the sink. 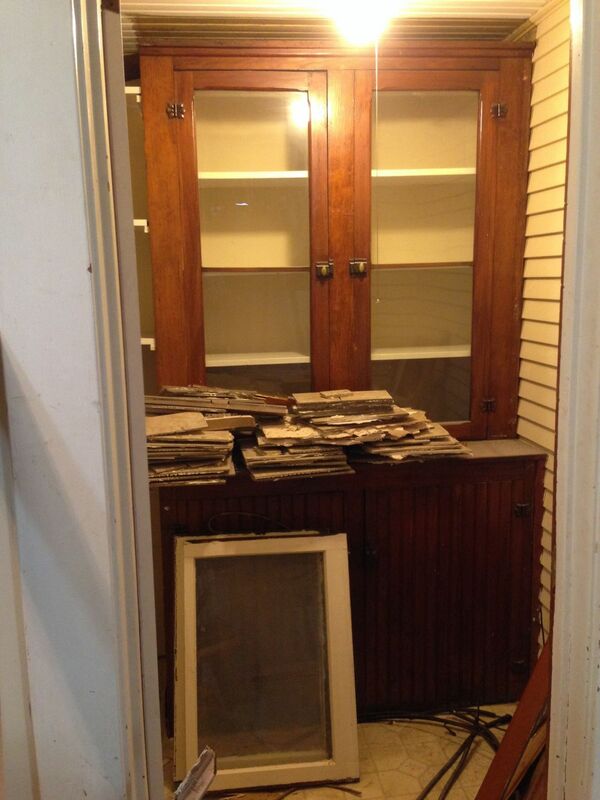 The circa-1950 ivy paper will be hidden, sigh, by the relocated 1921 cabinet. But it will survive. I am also uncertain as to what the counter tops will be. THOSE ARE MY CABINET PULLS! We are twins. Twins, separated at birth, obviously! I am sure you will make the kitchen look wonderful, Ross. Cannot wait for another post. Thanks for the confidence, Ken! I can’t wait to see this all come together! I can see it in my head and it is awesome and your cabinets are genius! You have a great head! Oh, I can assure you, it was a compliment! You wrote that you could see it all in your head. Not everybody can do that! So, you have a great head! That is what I had to have and had a bit of trouble getting it. We were treated as outcasts at the store, told “nobody” wants that sort of thing anymore. When we found one on catalog, they informed us it would take a long time to arrive (three weeks). What’s 3 weeks when you will using something everyday for years? When we finally had the built-in kitchen we originally planned but had to wait for the finances, we kept our sink. Yes, the workmen complained about its weight. I appreciate it everyday. Can’t wait to see your kitchen restoration. The drainboard sink and upper cupboard s will give the right touch. 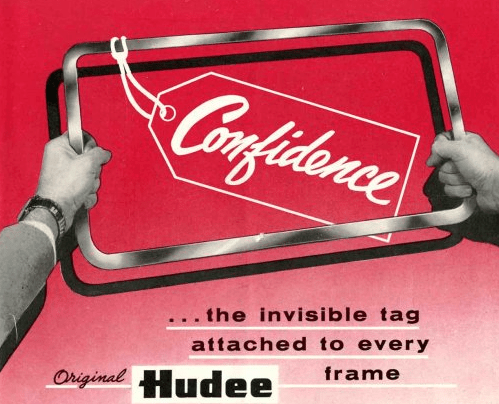 You have to check out the blog Retro Renovation for sources of metal countertop edgess. I remember that about my Grandma’s 1945 farm kitchen and cotton curtains with ric-rac trim. The floor plan makes the most of the space without seeming crowded.